Visitors to the Land Rover Burghley Horse Trials from 5-8 September will, for the first time ever, be able to book luxury glamping accommodation within the grounds of Burghley Park – in the beautiful Walled Garden, just minutes from all the action. Burghley Boutique will provide guests with spacious, well-lit Bell and Lotus Belle tents from the renowned and experienced Portobello Tents. Every tent comes fully equipped with memory foam mattresses, 13.5 tog duvets and Egyptian cotton bed sheets. With a range of different options (from cosy Bronze to the opulent VIP Lotus Belle), glampers can expect a terrific experience without scrimping on any creature comforts. Everything you need is within these walls – secure parking, luxury loos and showers, TV coverage of the event, food and of course a bar. The Walled Garden is a 15 minute walk from the Lion Bridge and less by golf buggy (of which there will be shuttles running back and forth morning and afternoon). Glamping accommodation can be booked now through the Burghley Boutique website: www.burghleyboutique.co.uk. For those wanting a little bit of ‘quirky luxury’ then a stay at either the Bull and Swan or The William Cecil may be just the thing. Both located on the outskirts of Burghley Park they offer unique, luxurious accommodation just a stone’s throw from the centre of Stamford. 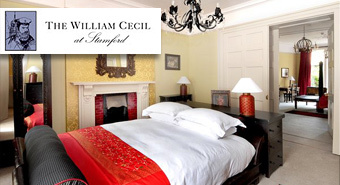 The William Cecil offers a home from home with 27 individually designed bedrooms, fantastic food with a nod towards great local suppliers and magnificent gardens and terrace on which to enjoy a glass of wine and relax. Both properties are delighted to be able to team up with Burghley and offer our unique Burghley Break which includes overnight accommodation at either hotel, dinner in the evening, breakfast the next morning and 2 tickets for the price of 1 for entry to Burghley House and Gardens of Surprise. Please click here for rates and further details. You can now stay in the Park, at Burghley’s Dairy! Visit http://www.burghley.co.uk/thedairy/ to find out more.